California’s biggest wildfire on record is expected to burn for the rest of the month, fire officials said on Tuesday. 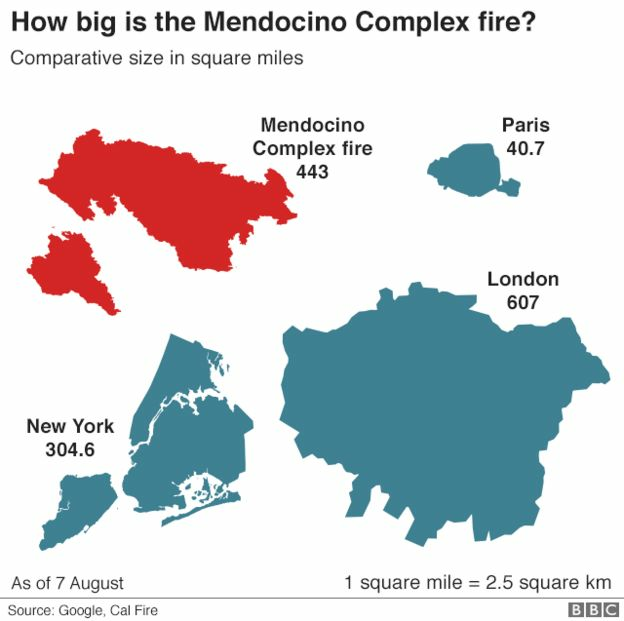 The Mendocino Complex fire has already engulfed 290,692 acres (117,639 hectares) – almost the size of Los Angeles. A separate blaze – the Carr fire, further north – has killed at least seven people and destroyed more than 1,500 structures. 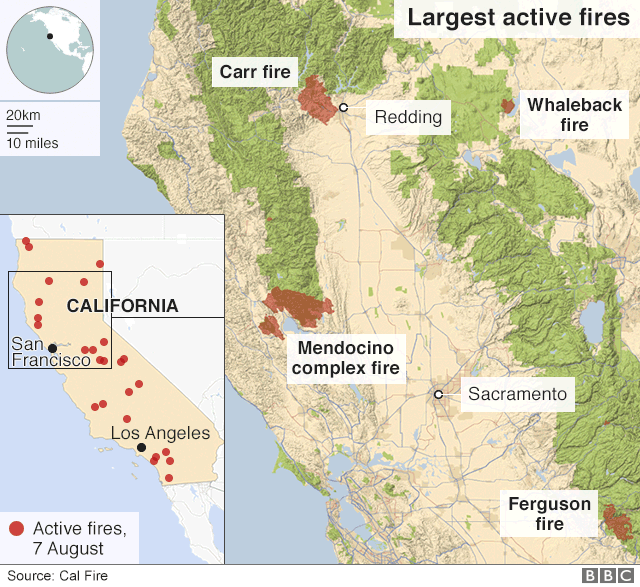 Burning through almost 160,000 acres, it was 47% contained by late Monday. The crews have been boosted by US army personnel and more than 1,000 prisoners. The inmates – who are considered low-risk offenders – work on a volunteer basis but they also receive $2 (£1.50) a day, plus $1 an hour. Firefighters told the LA Times about their gruelling schedule. One said his crew had slept – sitting up – in the seats of their fire engine on some nights. Experts say this year has been the worst start to the fire season in 10 years – partly due to the 2012-2017 drought that killed off large amounts of vegetation. National Weather Service meteorologist Brian Hurley has warned that conditions are not going to immediately improve – with temperatures as high as 43C (110F) being forecast for some areas. Unlike hurricanes – which follow an alphabetical list and are named before making landfall – fires are labelled more haphazardly.